When you’re a Cheesehead, nothing says fall like a trip to The Elegant Farmer in Mukwonago, Wis. With their world-famous Apple Pies Baked in a Paper Bag, apple orchards, pumpkin picking, frozen apple cider on a stick and more, it’s a great way to spend a sunny, autumn day. 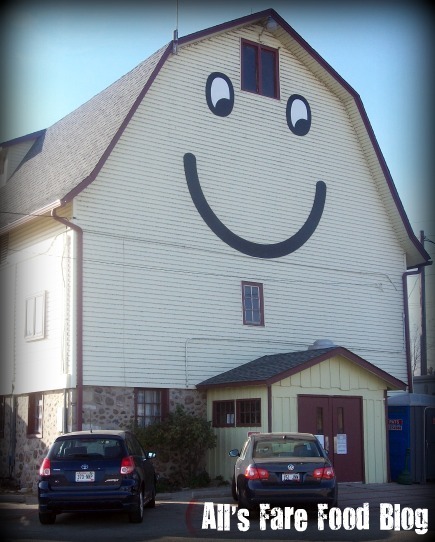 Also known for the yellow smiley barn, The Elegant Farmer is a country market with pizzazz. You can find fresh cheese and cured meats like sugared ham, fresh salads, and daily specials like chicken pot pies. Or, make your sweet tooth happy with some of their sugary treats like the gigantic muffins, pies and cookies. There’s also several varieties of fresh produce to create your own sweet and savory dishes – just in time for Thanksgiving. Find out more about The Elegant Farmer at www.elegantfarmer.com. Also, Thanksgiving pie orders need to be submitted by Sunday, Nov. 21. This entry was posted in Cuisine - American, Cuisine - Desserts, Foodie Destination, Places - Milwaukee, Places - Wisconsin and tagged Apple Pie in a Paper Bag, autumn, cider, Cookies, Elegant Farmer, muffins, orchards, pumpkin, video by Christina. Bookmark the permalink.